Hey everyone, we are back with another PUBG dev blog! PUBG has had a relatively quick, but intense, journey up until this point. The game has released on other platforms in the last two years with changes throughout the many phases of alpha and beta testing, from performance improvements and optimization, new weapons, new maps, new vehicles, and more. Now that we’re getting ready to launch the game on PlayStation 4 on December 7, we’d like to reflect on our development and feedback from our community, which has brought PUBG to where it is today. When we first started developing PUBG for console, the game was released as a beta, meaning stability was something we worked very hard to address. After a long beta phase and feedback from the community, optimization and stabilization became key for us. It was quite the challenge for the dev team to juggle our focus on stability while trying not to delay content that our community had been asking for, like newer maps. But this was a challenge that we were willing to take on. While we’ve grown considerably since our initial introduction on consoles, user experience and stability will always remain a pivotal aspect of our development. We are also focused on adding new content to the game and bringing Custom Matches, Ranked Mode, and Event Mode to the PS4 version after launch. We’ve very excited to take the lessons we’ve learned and share them with the PlayStation community when we launch. In addition, we’re excited to announce an exclusive gift for our PlayStation community to celebrate the launch. 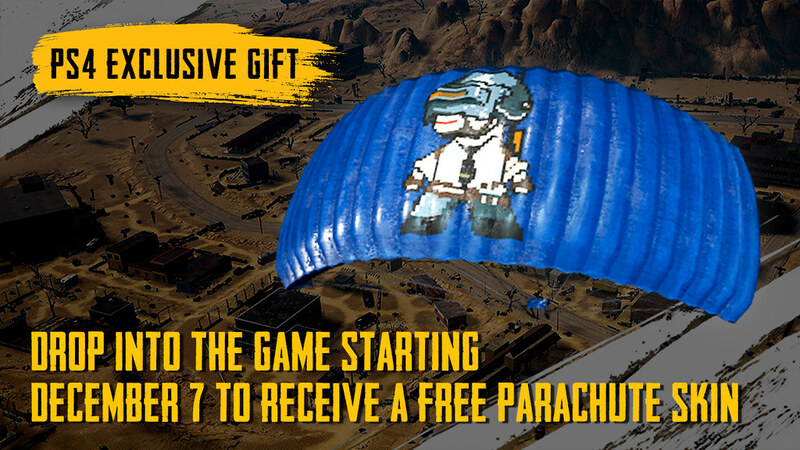 Starting on December 7, simply log into the game to receive the Pixel Art Parachute, inspired by the PlayStation iconic blue. You can still pre-order PUBG before the game releases on PS4 December 7. We have several different bundles to choose from, all of which offer two exclusive pre-order digital skins: The Nathan Drake Desert Outfit from the Uncharted series, and Ellie’s Backpack from The Last of Us. Pre-order and also receive two instant rewards: the PUBG avatar for your PlayStation Network profile as well as a theme. We offer different editions depending on what you’re looking for. The Survivor’s and Champion’s Editions can be purchased at a discounted rate just for pre-ordering on PlayStation Store! The countdown is on: we now have less than a week left until the official launch. We hope to see many of you at launch and can’t wait to join the PlayStation community on December 7!